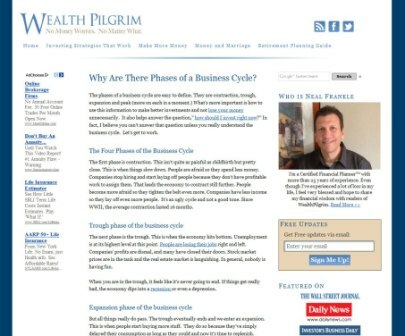 Wealth Pilgrim is one of the top personal finance blogs on the Internet, and fortunately for us, author Neal Frankle agreed to an interview. Not only does Neal offer a treasure trove of financial and life lessons, but he does so with a great sense of humor. 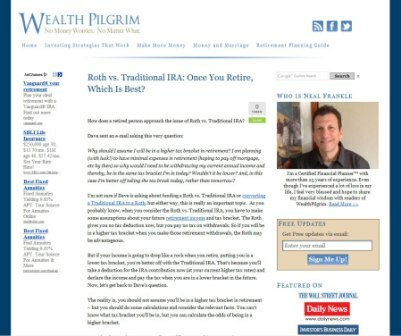 That said, let's welcome Neal from Wealth Pilgrim to Your Roth IRA! 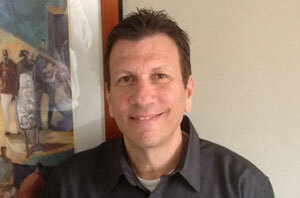 1) Hi Neal, thank you for sharing your valuable time with us. You have an excellent personal finance blog with an emphasis on investment strategies that work, making more money, and money and marriage. As an Independent Certified Financial Planner with an accounting background, you offer a depth of expertise that's often missing from the financial blogosphere. Please tell us a little bit about yourself and why you started Wealth Pilgrim. I was writing a book and my agent suggested I start a blog to build an audience for the book. The book project never advanced but the blog did! I love my blog because I get to connect with people I never otherwise would. Also, since I'm not trying to convince anyone to sign up for my services, I think it lets readers accept or reject what I write about at face value. There is no ulterior motive. 2) Your personal story is intriguing, instructional, and inspirational. Both your parents passed away before you finished high school, leaving you and your siblings devastated financially. What are the "must-do's" that parents with dependent children need to put in place to make sure their own children are taken care of if they pass away? I love this question. First, you must have enough life insurance. I recommend term insurance strongly. The problem is people don't know how much life insurance they really need. It's usually much more than people think. Fortunately, term insurance is pretty cheap. Also, parents must have a family trust and they must have guardians lined up in case something terrible happens. Finally, I strongly suggest the parents create a "family survival plan" complete with how the survivors are going to be cared for and by whom. Very few people do this. I understand that. But I lived with the consequences and it wasn't pretty. 3) In regard to your parents, you wrote that, "They 'wasted' no time creating a financial plan, and when they passed away, our family was completely destroyed. Clearly that has a lot to do with what I write about and how I write it. It also might have a thing or two to do with the person I am." The recent financial crisis has had a similar impact on countless young people who have watched their parents make poor financial decisions such as taking on excess debt and living paycheck to paycheck. No doubt, many of those children will grow up determined not to repeat the mistakes of their parents. If you could only give three pieces of financial advice to a young person just starting out, what would you tell them? This is another fantastic question. 1. Pay yourself first. Create a financial plan for yourself and figure out how much you need to save to reach your goal. Then, before you spend a dime on anything else, save that money. 2. Understand the balance between income, expenses and assets. All three have to be harmony. It doesn't matter how much you earn if your spending is way out of line. If your assets are large enough, you can use those to generate income and you don't have to work quite as hard. Understanding the relationship between income, assets and expenses is the key. 3. Track your expenses using a software package. I personally love YNAB (You Need a Budget) but you can use anything. You can even use an excel spreadsheet - but do it. Start now and don't stop. You'll be very happy down the road. 4) You wrote, "I have always understood that the very basis of financial security rests on appropriate spending." What do you consider to be the appropriate amount of spending? How much should a person save for emergencies? How about retirement? Each of these is an entire post if not a book. On spending, if you figure out what you need to save and then save it, you can spend everything else. That is fine. What happens when people start tracking and saving and see how easy it is, they tend to spend less and save more. But my rule of thumb is to identify your savings target, hit it, and then, spend away. Emergency savings is a function of how secure your situation is. If you have steady income and secure job, you may not need as much for emergency savings. I usually ask people what was the last amount you needed to come out of pocket in an unexpected way. That is a good measure of required emergency funds. For retirement, you must run some projections. There are plenty of financial calculators on the web. But you can also run your own financial plan. It's not difficult. Run that data and then you can easily figure out how much money you need to retire. 5) You also wrote, "My experience tells me that adversity really is a great tool. I'm not asking you to parachute your kids into Mogadishu on their 18th birthday. But I do believe we act at our highest level as parents when we let our kids grapple with life on life's terms - whatever the consequence... Let them swim in an ocean where they must get these ideas, and they'll master them in no time." 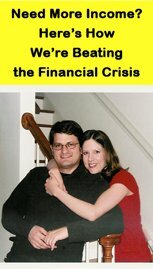 How do you think the adversity created by the recent financial crisis will impact the general public? Do you think we'll see a long-term shift toward hard work, thrift, frugality, and entrepreneurship? I have read that as a society, we have shifted towards frugality and that shift is sticky. In other words, the projections are that people won't go back to their free spending ways quickly. I also believe that more young people see the benefits of having their own business. These are fantastic changes because it creates so much more freedom for so many more people. 6) You have an entire section on Wealth Pilgrim titled "Money and Marriage." If you could give one piece of financial advice to a newlywed couple, what would it be? Don't be sure you know the answer. Be open minded. Really listen to the concerns of your spouse. Don't discount him or her. Don't think you are smarter either. Even though I am a CFP and professional money manager, my wife has come up with some of the most important financial directions our family has ever taken. 7) As a Certified Financial Planner with Wealth Resources Group, you offer financial services as an independent fee-based investment advisor. Unfortunately, most people don't know the difference between a fee-based investment advisor and a commission-based advisor. Can you explain the difference and whether or not one is preferable over the other? It is important to understand how financial planners work. An insurance agent or stock broker works for her insurance company or brokerage firm. She may be the nicest person in town but she doesn't work for you. People misunderstand that and it's really not their fault. The insurance and brokerage industry do their best to keep people in the dark about this. Of course, I am biased so you should take what I say with a grain of salt. But I think people should speak with a fee-only or fee-based registered investment advisor. It doesn't mean we are smarter or even necessarily more honest. But at least fee-based planners have the opportunity to be objective. 8) If an individual wants to use a Roth IRA to invest in the stock market, do you recommend purchasing mutual funds, index funds, individual stocks, or some combination thereof? You've written some wonderful posts on the Roth. And as you've written, the beauty of a Roth is that it's very long-term and offers great tax benefits. That being the case, people should use the Roth for growth in my opinion. I personally think that ETFs and mutual funds are the best bet for most investors but before investing they should investigate how different investment strategies work. They should understand what they are signing up for so they don't make emotional decisions when things get ugly. 9) In Why Your Spending Leads to Risky Investments, you mention launching a side business as a legitimate way for someone to increase income. With the Internet, it's never been cheaper or easier to start a new business. On Your Roth IRA, we encourage people to use the Internet as an avenue for turning a personal passion into an extra income stream. Given your own experience with Wealth Pilgrim, would you recommend the Internet as a viable option for generating extra income? How does your blogging experience so far measure up to the expectations you had when you started? Blogging is not an easy way to make money but you can do it. It takes a tremendous amount of work and dedication. To be honest, I think there are easier ways to make side money than with blogging. But blogging has scale and leverage. Once things start rolling you can scale up. That doesn't happen when you work on an hourly basis. So it is a great way to have your own business without spending a great deal of money. Just be prepared to spend a lot of time. Don't start unless you can stay with it. I understand that 90% of all bloggers quit within 6 months. If you have passion, some expertise and like to write, I do recommend it however. In my case, I wasted 2 years blogging about things I thought people should know about. Now, I write more about what people want to know about. When I started doing that, I started making money. At this point, the blog is doing far better than I ever imagined it would. But, entrepreneur that I am, now my income goals are much higher. I have a 5-year plan that is pretty aggressive. Wish me luck!